CannaRadiance™ Skin Therapy is formulated to assist with the appearance of trouble spots on your face, neck, chest, and other areas of your skin. It was designed to provide a premium quality, broad spectrum hemp extract standardized to contain 180 mg of CBD (Cannabidiol) per 10 gram airless pump. 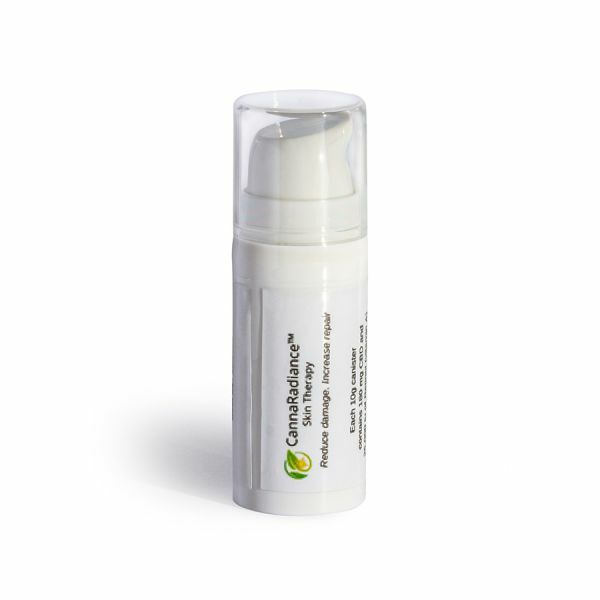 Importantly, this hemp extract is combined with other synergistic ingredients including aloe vera, 25,000 iu Vitamin A Palmitate, green tea extract, Panthenol (Vitamin B5), Vitamin E and 22 tropical oils and extracts. It is non-comedogenic (will not clog pores) and produces benefits in as little as three applications. Apply a small dime sized amount to trouble areas, as desired. Recommended to only use at night. This topical cream includes many fantastic ingredients, including Vitamin A Palmitate, which should not used in direct sunlight. Keep out of reach of children. Organic Aloe Leaf Juice, Deionized Water, Organic Sunflower Oil, Glyceryl Stearate, Glycerin (Kosher, Vegetable), Ethylhexyl Palmitate, Ceryl Alcohol, Organic Coconut Oil, Isopropyl Palmitate, Organic Cocoa Butter, Beeswax, Potassium Stearate, Organic Jojoba Oil, Shea Butter, Tamanu Seed Oil, Macadamia Nut Oil, Kukui Nut OIl, Avacado Oil, Borage Seed Oil, Flax Seed Oil, Evening Primrose Oil, Organic Rosehip Seed Oil, Organic Peruvian Maca (Lepidium meyenii), Broad Spectrum Hemp Extract, Vitamin A Palmitate, Panthenol (Vitamin B5), Tocopheryl Acetate (Vitamin E), Organic Green Tea Extract, Morinda Citrifolia Extract (Noni), Organic Arnica Extract, Centella Asiatica Extract (Organic Gotu Kola), Equisetum Arvense Extract (Horsetail), Wild Geranium Extract, Organic Dandelion Extract, Stearic Acid, Xanthum Gum, Sodium Carbomer, Phenoxyethanol, Ethylhexylglycerin.